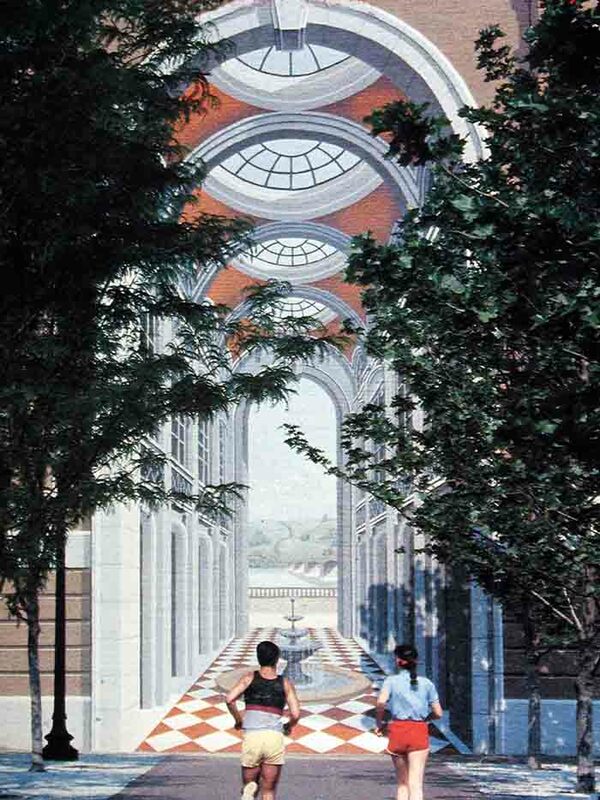 A trompe l'oeil means to 'fool the eye' and are usually ultra realistic paintings with true perspective on the walls of small courtyards or gardens that give the impression of the space being much grander. It would be a pleasant surprise for customers to walk up to a trompe l'oeil entrance painted either beside the real entrance, or on a durable curtain a few meters in front of the entrance. Realisation that the doors and everything else was 'fake' would be quickly followed by sighting the real entrance ....and having some doubt as to whether *that* was real or not. There isn't much of an original idea in this. Have three or four doors next to each other, only one of which is real. Change it every week or so. I would like to use a projector to run a moving trompe l'oeil - a door which horses or other creatures could occasionally peer out of.